For better labeling, get a better dispenser. Our Grab-A-Label asset label dispenser makes it easy to take your labels on-the-go! Save the mess for someone else - these convenient labels can be grabbed one at a time. Great for inventory, personal items, and more, these asset labels let you write in your own asset information directly on the label. Choose from vinyl or self-laminating designs to suit the needs of your working environment. • You can write on these labels, which feature a firm adhesive backing for easy bonding. • Click on any design to learn more about the material features of each label. 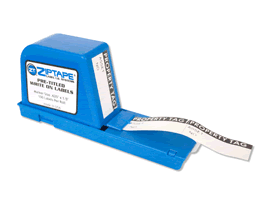 • Our grab-a-label dispenser lets you dispense one label at a time, without having to deal with lining and messy rolls.